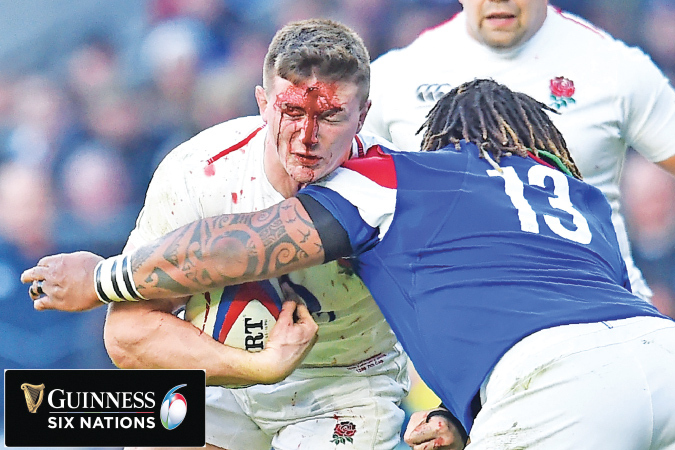 England's flanker Tom Curry (L) is tackled by France's centre Mathieu Bastareaud (R) during the Six Nations international rugby union match between England and France at Twickenham stadium in south-west London on February 10, 2019. TWICKENHAM, Sunday - Jonny May ran in a first-half hat-trick of tries as England thrashed France 44-8 at Twickenham on Sunday to make it two wins from two this year's Six Nations. England's 36-point margin of victory was only just shy of their largest against Les Bleus -- a 37-0 win in France's first match at Twickenham back in 1911. And the half ended with outside centre Henry Slade crossing for England's fourth try to leave them in complete command at 30-8. This victory followed England's 32-20 win away to reigning champions Ireland last week and was another impressive display ahead of this year's World Cup. For France, who will be one of England's pool opponents at Japan 2019, it was their second straight defeat this Championship after they squandered a 16-0 half-time lead in a 24-19 loss to Wales in Paris. Barely had the anthems finished when France's bid for a first Six Nations win at Twickenham since 2005 was rocked by May's opening try. And after sustained forward pressure Farrell's cut-out pass found May who, one-on-one with not much room to play with against Penaud, beat the Frenchman all too easily for another try in the left corner. France's day went from bad to worse in the 50th minute when they were reduced to 14 men as Gael Fickou was yellow-carded for tackling Ashton without the ball near the try-line -- an incident that also saw experienced referee Nigel Owens award a penalty try that extended England's lead to 37-8.